The European Union has 27 members. Of these, 17 member states have adopted the euro as their common currency. This common currency union is called the eurozone (written in lower case). As you know, the monetary policy of a country is made by its central bank. For example, the Reserve Bank of India, India's central bank, formulates the monetary policy. Similarly, the eurozone too has a central bank: the European Central Bank, based in Frankfurt, Germany. 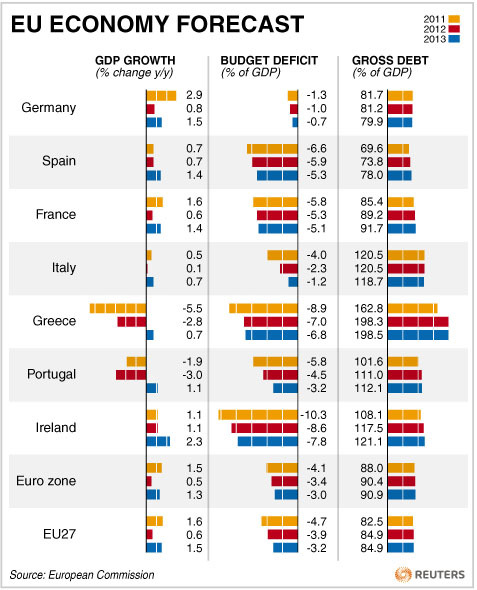 Check out the below terrific Reuters infographic for a lowdown on the debt, GDP, and budget deficit status of some of the most vulnerable eurozone economies. The combined GDP of these 17 eurozone members is a little over 9 trillion euros (2010). Budget Deficit refers to the (negative) difference between income and expenditure. In more simple terms, budget deficit arises when a country's government runs up expenditure which is greater than its revenues. To fund this deficit, the country has to borrow, either from internal sources or from external bodies (like foreign banks). This borrowing is called debt. As the graphic depicts, Greece’s total debt is a whopping 162% of its GDP, and is further likely to touch 200%! The above graphic relates the same picture about Ireland, Italy, and Portugal. These nations, along with Spain, are facing mounting debts, but they do not have enough funds to pay their debts. These nations borrowed heavily, raised public sector salaries, built public infrastructure, and upped social welfare spending. In a sense, they made merry with borrowed money. However, they forgot to fix the tax system. The tax collection systems in these nations are riddled with loopholes, which helped encourage massive tax evasion. Tax revenues are the biggest source of a government’s revenues. From these collections, the government pays the interest and sometimes (part of) the principal. However, an inefficient tax system leads to poor tax collections, which rendered these countries incapable of honouring their debt payments. When you do not pay your debt on time, you are declared a defaulter. Once a country defaults, it becomes untrustworthy in the eyes of the lenders (like foreign banks and multilateral institutions like IMF). So the lenders begin to charge a higher rate of interest, which in turn, raises the mountain of the country’s debt. This is precisely the anatomy of the problems faced by some of the eurozone nations like Greece, Portugal, Spain, Ireland, and Italy. In my next post on this issue, I will dwell on the likely effects of the eurozone Debt Crisis. That was really insightful Sir! As this one followed the yesterday's videos on the meltdown, it connected very well my/our thoughts/questions. Thanks for sharing it! I have a request in this regard sir. Could you please direct me or post something on sovereign funds, World bank and IMF. I'd do my bit in gathering further info. and understanding it. I thank you once again! Kudos, very well explained in simple language!! sir,how can the banks have amount of money required to support entire nations...what are their main sources of income.can u please shed some light on this topic..
Nice insight into what has happened. Would like to know what happened after Super Powers like France, Germany etc rolled out a bail-out package. Also has General Motors going bankrupt added to this crisis. I would be glad if you could kindlt phrase all the possible reasons which paved way for the EURO ZONE CRISIS. Major European countries have many global companies like telenor, walmart GE, GM etc to name a few they make lot of profits internationally but why is that their countries suffer in debts? And what is the monetary situation in India, Do these factors affect Indians also? Thank you very much sir..this really clear my doubt about the origin of Euro zone crises.. Thanks a lot Sir for the post. Very simple and giving a clear picture. I would also like to know what were the loopholes in the tax system of the Eurozone economy? And also why was India not affected by this crisis (role of RBI)? Can you explain these in simple terms?